Road trip! I was not expecting to be on the road for seven hours today, but I was. A co-worker and I got the tour of lower, central Michigan. We had to go to Lansing first then up to Mt. Pleasant and be back in Grand Rapids before 9:00. After wrapping up in Mt. Pleasant, we started talking about dinner. I would have loved to have stopped at Mountain Town Station or Pisanello’s, but we didn’t have time. We started heading out of town looking for something quick. The first, and as it turns out, only thing I came across was a McDonalds. We decided we could do better and kept driving….and driving…and driving. We found out the hard way, there’s really not much between Mt. Pleasant and Grand Rapids. After a half hour of driving, we came up to a rural intersection in right on the edge of Canadian Lakes. I saw the sign for a Shell Station and craned my next to see if there were any restaurants down the street. 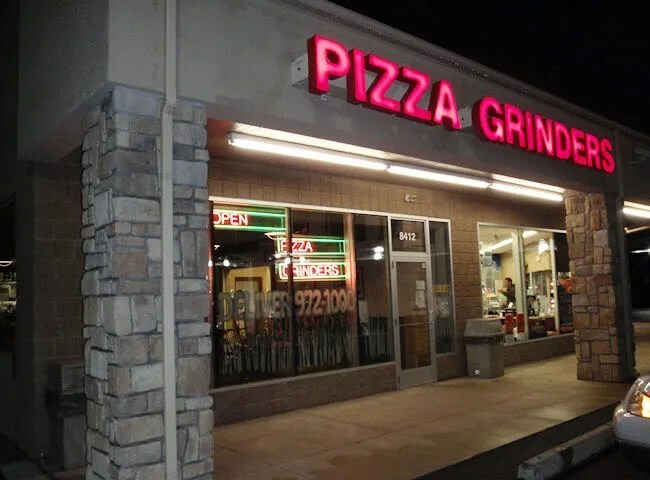 I noticed the words “pizza” and “grinders” in lights next to the gas station so I turned to see what I could find. Mancino’s of Canadian Lakes (which also uses the name Lakeside Pizza & Grinders) is near the corner of 100th and Buchanan in very rural Stanwood. On the map, it actually looks closer to Mecosta, but it has a Standwood address. It shares space with the Country Corner Shell near the Canadian Lakes in Mecosta County. A unique feature of this Mancino’s is that they have Cold Stone Creamery Ice Cream. I thought it was odd, but they have a small case next to the cash register. The lady in front of us picked up three sandwiches and was getting three ice creams as we were waiting to order. Waiting to order…yeah. We were in a little bit of a hurry so this was annoying. There were four people in the kitchen. Three of which were just waiting for us to order so they could make our sandwiches, but no one would take our order. The one guy running the register was slowly taking care of the lady getting ice cream, so my co-worker and I had to wait. When it was time for us to step up, I knew what I wanted. Ever since I was little, I have always gotten the Pizza Grinder. My co-worker, being new to the area, has never been to or heard of Mancino’s, so she followed my lead. I was really hungry, so I ordered the “full” sandwich which is 18″. She did the same and was a little surprised when she got the box and realized the size of the box reflected the size of the sandwich. We added on two large Pepsi’s which brought the total to around $23. We filled up our drinks then tried to get a strong enough cell signal to check our email in this rural area. As I was angrily trying to refresh Twitter, I heard my name called. I got up to grab the two boxes and we headed to the car to finish our trip to Grand Rapids. My C.W. ate half of her sandwich in the car and seemed to really like it. I know she had never had a Mancino’s grinder before and she was happy to hear that this was somewhat of a regional chain. As for me, I knew it would be hard to eat in the car, so I waited until we got back to the office. As I’ve mentioned in other Mancino’s reviews, I’m a big fan of bread which is probably my favorite part of the Mancino’s experience. The toppings seemed to be a little on the skimpy side, but the bread is so yummy I didn’t really notice. You have no idea how happy I was to run in to this Mancino’s which is seemingly in the middle of nowhere. 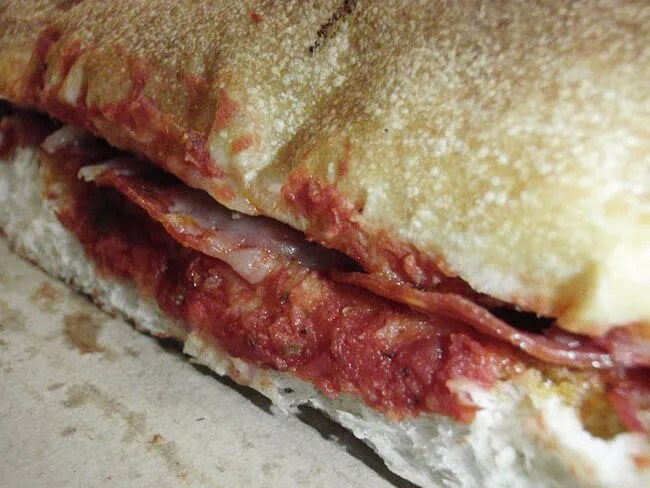 Initially, service was a little on the slow side, but our sandwiches came out very quickly and lived up the Mancino’s name. Went there tonight on your recommendation. Staying in the area, on a short a short vacation. 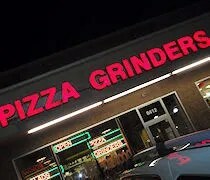 Had the pizza grinder & it was great! Thanks for the write up. Pizza at a gas station scared me but after reading it’s a Mancino’s, it sounds great! Will give it a try tonight!